Preheat oven to 350 degrees. Roll our pie crust and using a round cookie cutter (mine was a 2.5 inch circle), cut out 18 rounds (you can get about 9 rounds from each pie crust using this size of cookie cutter). Next lay 1 round on the counter, put about 1 tsp pie filling on each round. then cover with another cookie round and seal edges with a fork. Place on un-greased baking sheet. Poke a small hole in the top to allow it to vent. Beat egg in bowl, then using a pastry brush, brush the top of each cookie with the egg and sprinkle with cinnamon sugar. Bake for 20 minutes. 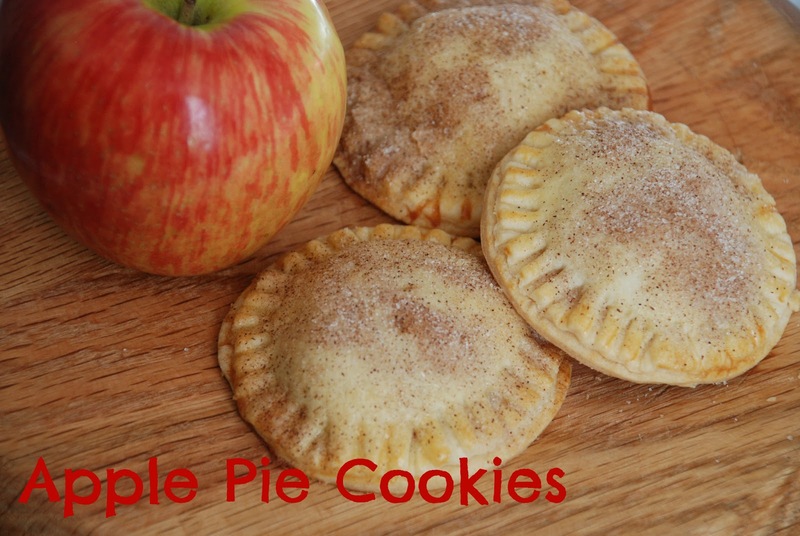 I love apple pie so these cookies were a perfect match. They were easy to make and would be good with so many different kinds of filling.